« Homepage / Gourmet / "Taking a Culinary Adventure: experience the wonders of India in Covington"
Indian cuisine is becoming increasingly popular due to its exotic flavors and healthful preparations. 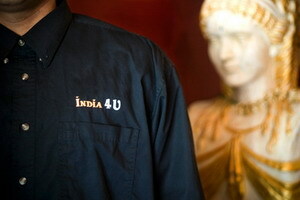 A new restaurant, India 4 U, opens in Covington this month, the first of its kind in the city. Located on Highway 190, the handsome new 100-seat dining establishment is owned by businessman Akarsh Kolaprath. Although he is not the chef, Kolaprath went to cooking school for four years in India. He was top chef at the Four Seasons in Bombay and also was a chef on a cruise liner. He owns the original India 4 U restaurant, which opened in February on Highway 43 North in Picayune, Mississippi. His other businesses include In Style Stones Direct (instylestonesdirect.com), Building Supplies Direct (buildingsuppliesdirect.com), and Exotic Stones Direct (exoticstonesdirect.com), located in Carriere, Mississippi. "We want to implement the south Louisiana style into the menu with different flavors using the freshest food from the region," Kolaprath says. "Our food is very healthful." 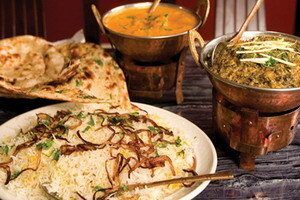 One myth about Indian cuisine is that everything is spicy. Not so at India 4 U. You can order the food mild, medium, spicy or extra hot, and there is everything from vegetarian dishes to tandoori chicken (marinated in yogurt and spices and cooked on a high heat in a clay oven), fresh seafood, lamb, healthful soups, and salads. The menu is quite extensive, representing various regional styles of cuisine. It features no less than a dozen kinds of freshly made breads, for example. A catering division is also being introduced. "Catering will be offered for up to 10,000 people, for both Louisiana and Mississippi," Kolaprath comments. The beauty of Indian cuisine is that it presents a range of flavors, from subtle to intense, mirroring the country itself. Spices are the soul of Indian food, making simple ingredients come alive. Mild spices include fennel, cumin, coriander powder, and tumeric; stronger and more pungent spices include garam masala. Fresh herbs like mint and green chilies are often used. India is slightly smaller than Europe (1,226,595 square miles) but it has a greater diversity of people, climate, culture, and religion than almost any country in the world. The food is as diverse as its people. Culinary styles are often tied to various religious beliefs. "We at India 4 U have recognized this uniqueness and variety of cuisine that India offers and take pride in presenting to you specialty cuisines from the land of Hyderabad, Lucknow, and the northwest frontier," Kolaprath states on the menu. The food of Delhi and Lucknow incorporates the addition of cumin, coriander, tumeric, cardamom, cinnamon, and ground chilies typical of the North. Mustard seeds, curry leaves, hot chilies, tamarind, and coconut milk infuse the dishes of Hyderabad. The dum pukht style of cooking, which was practiced by chefs of the rulers of Lucknow in the late 1700s, is the predominate style at India 4 U. "Dum" denotes cooking over a slow fire and "pukht" signifies the purity and cleanliness with which one approaches the ritual of cooking. Meats and vegetables are simmered gently in their own juices, resulting in delicious and aromatic creations. 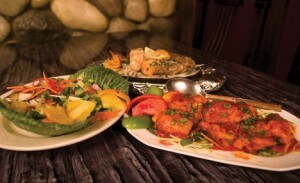 All tandoori specialties at India 4 U are served in sizzling hot plates. The audible and olfactory effects combine to create great anticipation of the first bite. A tandoor (clay pot) oven produces very different aromatic flavors compared to food cooked on a regular stovetop. Try the chef’s special, Pearl of the Sea, which combines crawfish, tandoori shrimp, and tandoori salmon with special spices and herbs. Or sample the tandoori lobster, which is mildly seasoned with kashmari herbs and spices. The chicken tikka (this means little pieces) masala is a house specialty, made with boneless chicken marinated and cooked in the tandoor and sautéed with tomato based sauces. Masala translates to spices, herbs, and other seasonings ground or pounded together. When wet ingredients are added to the spice mixture it is called a "wet masala" and dry spice mixtures are called "garam masala," more commonly known as curry. Sample the various styles of biryani, an elaborate dish made with spiced saffron rice prepared in the dum pukht style of cooking (pieces of lamb, chicken, or vegetables are added). This dish is usually made on special occasions since it takes so long to prepare, and is a real treat at India 4 U. Seafood delicacies include a delectable fish curry made with boneless catfish cooked in a mildly spiced sauce, and the crawfish special of the day. There are thirteen vegetarian offerings, including yellow dal (lentils cooked in butter with ginger, garlic, and spices), and palak paneer prepared with spinach and homemade cheese, cream, and mild spices. Paneer is a white smooth cheese found in north India. One can make a meal of the bread alone, accompanied by mango chutney or cucumber raitha (homemade yogurt mixed with cucumbers, carrots, and masala). There are several desserts to select from. End the meal with the India 4 U homemade mango ice cream prepared with cream cheese, mango pulp, and milk. A kid’s menu offers simple fare for little ones. Prices are very reasonable at this wonderful new restaurant that is soon to be the talk of the town. 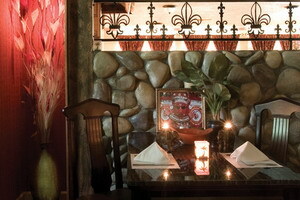 Here you can write a comment to the post "Taking a Culinary Adventure: experience the wonders of India in Covington"